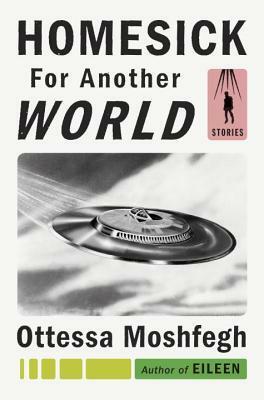 In one story from Ottessa Moshfegh’s new short story collection, a character is described thus: “despite being pretty and soft as flesh, there was something harsh about her… Something crude” (An Honest Woman). This assessment of harshness and crudeness could easily be applied to any of the stories from Homesick for Another World, in which Moshfegh transfers the scummy inelegance of her Booker-nominated novel, Eileen, and somehow uses it to create even more unpleasant characters. Bettering Myself, the opening story, begins with the following juxtaposition of religion and regurgitation: the tone is set for the rest of the collection. If any of this sounds like a criticism, it assuredly isn’t. Moshfegh’s ability and willingness to craft wholly unsympathetic and largely reprehensible people set her work apart from contemporary literary fiction; there’s something Dickensian in the grotesque nature of some of her creations, and the likes of Daniel Quilp from The Old Curiosity Shop would fit right in here. The protagonists of Homesick for Another World can be broadly divided into a couple of categories. Firstly, there are those who feel oppressed by their own sense of worthlessness and degradation, like the narrators of The Weirdos and Slumming. Then come brief interludes of speakers whose unpleasantness derives, conversely, from their overwhelming arrogance, for example in A Dark and Winding Road and Nothing Ever Happens Here. There’s at least one genuinely nasty piece of work here, in the form of Mr Wu‘s eponymous character, with his deeply hypocritical stalk-reject-repeat philosophy. Overall, it is the resolute unspecialness of Moshfegh’s cast of characters that gives these stories their impact; they are somehow beyond mundane, plumbing the depths of the human psyche without doing much more than pushing the boundaries of what is socially acceptable. It’s not just in their morality that these characters show their overt repulsiveness; Moshfegh seems to take great pleasure in detailed depictions of their physical imperfections. Obesity, pimples and dental horrors feature heavily; the character Jeb, from An Honest Woman, is said to have “exposed the deep rot of his clawlike teeth. They were nearly black along the gums,” and those aren’t even the worst molars in the book. In the same story, the Honest Woman herself is described with detailed reference to her armpits, which are “gritty with tiny hairs and flecked with white clumps of deodorant.” She is, I suppose, at least trying to exercise some personal hygiene, which is more than you can say for most of Moshfegh’s creations.It’s not a particularly big leap to assume that these physical quirks are symbolic of the moral decay we see in the characters’ actions. There’s something animalistic about many of these people, and that’s just the ones that aren’t downright bizarre. “I’m the surrogate vice president of a business empire,” I’d say. I’d sit them down on the rented couch and give them a clear plastic bag to put over their heads if they so desired. When my swelling was particularly bad, I got a little uptight. “I do not want to make love,” I said to one man I remember. He was handsome and tan. He wore white clothes for dancing the capoeira, which is what drew me to him. “Do not want,” he repeated, chortling under the plastic, his eyes sparkling. There was an even weirder excerpt I wanted to use there, but then I realized there’s a chance my mother might read this review, and I don’t want her to disown me. That’s how grim it is. There’s a real aimlessness to existence running throughout the collection too, with the nihilistic teacher in the opening story echoed later on in Slumming, in which another educator spends her summer vacation haunting public conveniences to buy unidentified drugs from “zombies;” Moshfegh seems to be taking a swipe at society’s hypocrisy here, exaggerating its extent, perhaps, but nonetheless highlighting the demons that lie dormant in all of us. Malibu‘s narrator begins by telling us “in order to collect unemployment benefits, I had to fill out this log of all the jobs I’d applied for. But I wasn’t applying for any jobs,” while Nothing Ever Happens Here features a self-proclaimed actor who never actually does any acting. It’d be easy to see this ennui as further evidence of these characters’ lack of self-worth, but that’s not quite right; most of them don’t see anything as important, let alone themselves. It’s why they stay in terrible relationships, allow themselves to be mistreated and generally extinguish their own humanity: for them, there isn’t really anything else. As I come to conclude this review, I realize that I may have made Homesick for Another World sound absolutely horrible. It’s not an inaccurate or unfair description, but it’s also the whole point; if you’ve read Eileen, you won’t be surprised by anything here, although you may find that Moshfegh has dredged the pool of human vileness even deeper with this collection. For me, that’s what gives this book its strange appeal; there’s nothing here that’s unbelievable or outlandish, and this collection, more than anything else I’ve read, is most likely to make me slightly suspicious of what’s going on in the minds of those around me. I appreciate beautiful writing, but I also recognize that there are a million blueprints for it; while readers and critics may extol the virtues of a gorgeous opening sentence, I wonder whether it isn’t far more challenging to write something seemingly without charm or grace – something whose whole aim is to repel and disgust. In this sense, I think Homesick for Another World is a truly rare achievement, and one that makes me intrigued to see what its author does next. Where I live in contemporary America, it is much more rare to see the cosmetic imperfections Katy Goodwin-Bates mentions in her review of Homesick for Another World than it is to be exposed to the moral apathy she details. This book of grotesques appears to be filled with characters that are oddly familiar to me. I think the book’s author, Ottessa Moshfegh, might be chronicling the spiritual vacuum that has led many in current society to sink into behavior that stems from a lack of self-worth and a lost compass for divining any higher calling than immediate gratification. Sadly, unlike the protagonist in Winesburg, Ohio, that century-old, famous collection of short stories that documented the misguided or unfortunate grotesques found in a small town, today I can not escape the cultural landscape in which I live by moving to the big city.